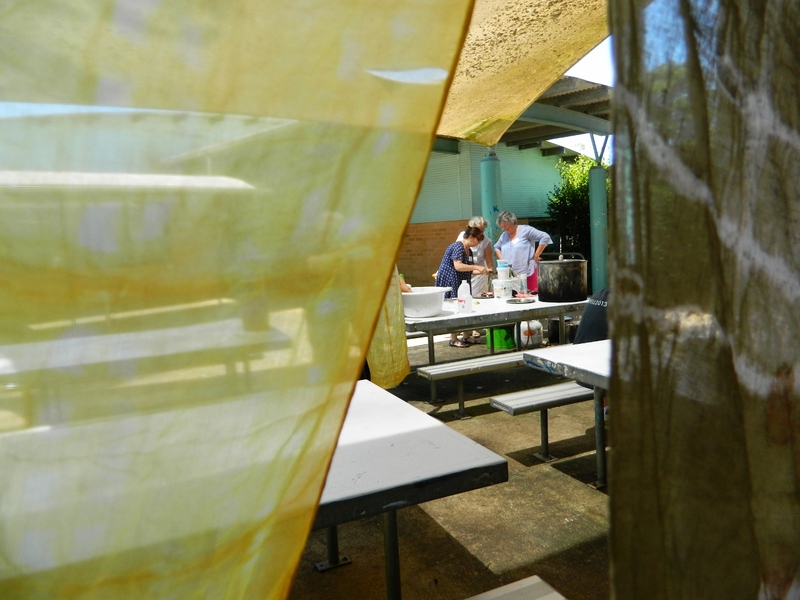 I’ve just spent a week at Bellingen’s annual Camp Creative, and I think I might be developing a new obsession – dyeing natural fabrics with plant pigments. For five days, the ever patient Anne Leon guided us as we experimented with leaves, seeds, flowers, twigs and vegetables which we placed between layers of natural fabric and then wrapped around pvc pipe, folded, clamped or tied and dropped into simmering pots of lemon myrtle, eucalyptus, red cabbage and brown or red onion. Checking the pots for unexpected results! Here is a selection of unexpected results which I am happy to show off. a creative use instead of just being composted ? a great week and lots of creative learning. Yes, we all had such fun, and I can’t wait to experiment some more. I am already prowling round the garden looking for possibilities. me too. And on the hunt for large boiling pots! Aha – I bought a medium sized one at the markets on Saturday. Looks like we might be competing for pots!